The Taking of Christ by Caravaggio, 1602. The arrest of Jesus is a pivotal event recorded in the canonical gospels. The event ultimately leads, in the Gospel accounts, to Jesus' crucifixion. Jesus was arrested by the Temple guards of the Sanhedrin in the Garden of Gethsemane, shortly after the Last Supper (during which Jesus gave his final sermon), and immediately after the kiss of Judas, which is traditionally said to have been an act of betrayal. The arrest led immediately to his trial before the Sanhedrin, during which they condemned him to death. 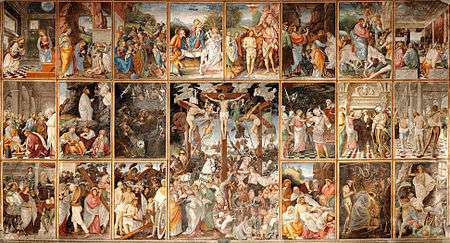 In Christian theology, the events from the Last Supper until the crucifixion and resurrection of Jesus are referred to as the Passion. 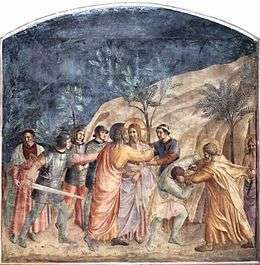 The Capture of Christ by Fra Angelico, c. 1440, depicting Judas and Peter, cutting the ear of the Malchus, the servant of Caiaphas. According to the canonical gospels, after the Last Supper, Jesus and his disciples went out to Gethsemane, a garden located at the edge of the Kidron Valley, thought by scholars to probably have been an olive grove. Once there, he is described as leaving the group so that he can pray privately. The synoptics state that Jesus asked God that his burden be taken from him, and requested not to need to undergo the events that he was due to, though giving the final choice to God. Luke states that an angel appeared and strengthened Jesus, who then returned to his disciples. The synoptics state that the three disciples that were with Jesus had fallen asleep, and that Jesus criticized them for failing to stay awake even for an hour, suggesting that they pray so that they could avoid temptation. At that point, Judas gave Jesus a kiss, as a pre-arranged sign to those that had accompanied Judas as to who Jesus was. Having been identified, the officers arrested Jesus, although one of Jesus' disciples thought to stop them with a sword, but cut off the ear of one of the arresting officers. The Gospel of John specifies that it had been Simon Peter who had cut off the ear of Malchus, the servant of Caiaphas, the high priest. Luke adds that Jesus healed the wound. John, Matthew, and Luke state that Jesus criticized the violent act, insisting that they do not resist Jesus' arrest. In Matthew, Jesus made the well known statement "all who live by the sword, shall die by the sword". The account in the Gospel of John differs from that of the synoptics: only in John do Roman soldiers help to carry out the arrest. 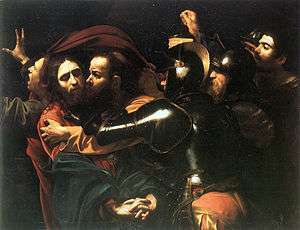 Judas leads the arresting party to Jesus, but rather than Judas pointing out Jesus, John has Jesus himself, "knowing all that was to happen to him", ask them whom they are looking for; when they say "Jesus of Nazareth", he replies "I am he", at which point all members of the arrest party went backward and fell to the ground. Wikimedia Commons has media related to Arrest of Jesus Christ.